I wasn't planning on making a blueberry tart, but when I went to my local market, they were selling two pounds of blueberries for six dollars. Who can pass that up? A good tart dough recipe is key to a good tart and I think I've found a good one from Once Upon A Tart, a great cookbook from the bakery in New York. In most cases, I like to fully bake the tart shell so I can make the filling on the stove top and add it to the crust as the final step. Add 3 cups blueberries, sugar and water to a medium saucepan and simmer over medium heat, stirring occasionally. The blueberries will begin to break down and the mixture will turn into a wonderful, syrupy blueberry mess. After about 15 minutes, remove from heat and let cool. 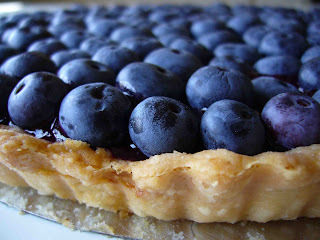 Place filling into fully baked tart crust (recipe to follow) and top with remaining blueberries in concentric circles. Melt jam in a saucepan on the stove and brush jam over blueberries. Chill until ready to serve. Remove one dough disc from the fridge and roll out to an 11 inch circle. I slide the removable bottom from the tart pan under the dough to help transfer it to the tart pan. Shape the dough to fit the pan and cut off extra dough. Fit a piece of aluminum foil to the dough and fill with pie weights or dried beans. Bake in oven for 10 minutes then remove foil and pie weights. Continuing baking for 15 more minutes until the crust is golden. Let cool and then fill with desired topping.